Yesterday we reported that Luigi's Mansion 2 was listed as a two-player game on the Nintendo of Europe website. We've now received confirmation from Nintendo that this was an error and that the game is single-player only. 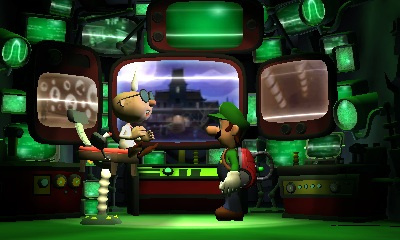 Luigi's Mansion 2 is set for release in early 2012. Read our Luigi's Mansion 2 preview for an early overview of Next Level Games' upcoming Poltergust 'em up. Thought so. Just the other day, I saw they listed Skyward Sword as compatible with the Classic Controller on the Nintendo Channel, lol. Makes sense, didn't see how the multiplayer would offer something significant in the context of the game anyway. I've seen screenshots of Luigi and Toad in a room together with flashlights though on Nintendo3DSblog.com so I figured that was part of the multiplayer. Hopefully its not a situation where it was formerly multiplayer and then they dropped it. There are already almost no games to play with people on your friendlist till Mario Kart comes out so another multiplayer experience would be very much appreciated. Aw, I was interested to hear how multiplayer would even work in Luigi's Mansion. Oh well, still gonna be a great game. Yeah, it isn't essential to the game at all but could at least have made for some nice minigame modes. While it's not so bad i'm still a bit disappointed now. Bottom line: Please get your act together, NoE ! Less because of this tiny mistake, more because of the situation Club Nintendo is in and the inability to keep some of their dates. Meh, whatever. It just means Nintendo will focus on making the best possible single-player experience! Can't wait! @10 True - but would it hurt to allow the single player game to be played with a second player? I just love the term Poltergust 'em up ! Good thing the game itself looks pretty cool. just when i was getting my hopes up. oh well. Maybe the dope who listed it as a two-player game was the same person who categorizes the games on the eShop. Oh, let's look at "Action Games"! Plants vs. Zombies? What a great premise! I didn't know PopCap made any action games– oh. They still don't. No-op? That mix-up makes it almost worth it to say that, because I got a good laugh out of it. In the last article, somebody predicted this. Still one of my most highly anticipated games either way. This is the worst news I've ever heard in my life. Was wondering how that would work anyway. Aw come on.... oh well, hopefully the game will still be as good as it looks! aw dat suks -_- well who cares the game will be its best once it comes out.I wish the game haz multiplayer but im o-k with it. Haha this article is funny. @swordx Well now that it indeed DOES have multiplayer, it is!